Pet food with no artificial flavourings or colourants added. Cat food with highly digestible natural ingredients. Omega 3 and 6 for healthy skin and coat of your pet. Vitamin E to support natural defences. 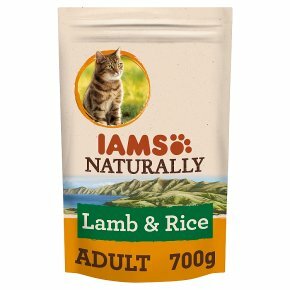 IAMS Naturally cat food with New Zealand lamb and rice provides cats with a 100% complete and balanced diet. It is made with a selection of highly digestible natural ingredients for visibly healthy, strong and happy pets. The highly digestible ingredients mean cats can absorb nutrients from their food, helping them to look and feel great on the inside and out. Size of Cat: 2kg, Amount per day: 25-40g Size of Cat: 3kg, Amount per day: 40-60g Size of Cat: 4kg, Amount per day: 55-75g Size of Cat: 5kg, Amount per day: 70-95g Size of Cat: 6kg, Amount per day: 80-115g Size of Cat: 7kg, Amount per day: 95-135g Or Size of Cat: 4kg, Amount per day: 34g kibble+ 1 x 85g Wet pouch Feeding Guidelines: When switching to IAMS Naturally, gradually introduce over 4 days. In keeping with the cat's natural behaviour, we recommend you divide the daily portion into at least 2 meals a day. Always ensure fresh water is available.